Matt & Jamie’s Destination Wedding Bouquet Recreation’s — Paper Rose Co.
Over the six weeks between Mother's Day and the end of June, I shipped out 21 custom orders. That's about three projects per week—most of which were anniversary bouquets or wedding suites, and all of which had been on my schedule for months. Needless to say, June was over before I knew it and now I'm flush with gorgeous flowers to share. Let's dig in! Matt contacted me early this year to help him create this gift for his wife in celebration of their first anniversary. Given the restrictions of their destination wedding, Jamie was unable to hold onto, or try to preserve her bouquet. 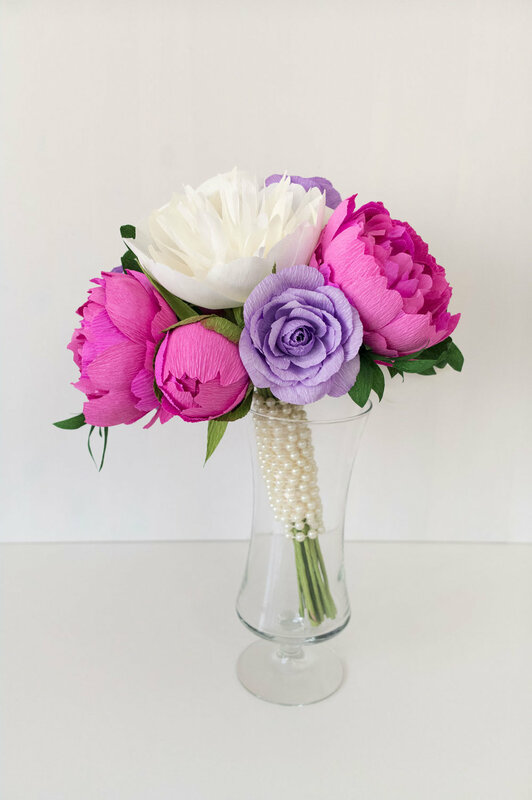 I decided to capture the blooms her florist used in their freshest and most vibrant state, creating a bright, crisp spring assortment of white peonies and ranunculus, lavender-hued roses, and pink peonies. Per Matt's request, I even found a strand of faux pearls to mimic her original wrap! I finished this piece before the peonies were blooming, and you better believe this had me in the mood for Spring! I held off on sharing this post until I restocked my Perennial Collection—which used to include brighter pink peonies quite similar to these. Now I'm wondering if I should bring those back? Let me know if you agree. And don't worry—there are many, many more peony varieties on the way. (And I mean many!) Stay tuned for more posts and other fun updates to the shop!